GE Fanuc Automation , a unit of GE Infrastructure, has unveiled a detailed roadmap for the Proficy Automation and Production software family – which spans from programming and control to HMI / SCADA to historian and MES to a real-time information portal. GE Fanuc will deliver a major upgrade to Proficy with a data-model and event-based platform based on the Proficy Historian and Proficy Real-Time Information Portal technologies. The new platform will allow users to standardise on a single manufacturing IT platform for managing real-time operations. The Proficy Platform will include packaged integration with enterprise systems and Proficy HMI/SCADA applications as well as provide an [GI1]extended library of tools and published APIs for third-party development of applications. Targeting the fourth quarter 2005, GE Fanuc plans to release the Proficy Platform, which consists of a Proficy Server and Proficy Console. The Proficy Server provides a centralised production management hub based on an S95 data reference model and the high-performance Proficy Historian data management technology to deliver a contextual information backbone for all Proficy applications. Based on the OPC Unified Architecture (OPC UA) emerging standard, Proficy Server will allow users and GE Fanuc partners to extend the data model with User Defined Types and drive better workflow functionality. Proficy Server will greatly reduce customers’ manufacturing IT costs and provide a faster return on investment with common application licensing, managed deployment, integrated security, and improved diagnostics for greater uptime. Concurrent with the Proficy Server release, Proficy Console is based on the Proficy Real-Time Information Portal and provides a major upgrade with multiple data-model views into operations. These views include: equipment models for aggregating data by actual equipment layouts, product and production data models for representing material flow, and IT models for managing application licensing and deployment across the enterprise. The Proficy Console provides users with a “command center” for interfacing to Proficy applications and third-party legacy systems, and is packaged in an easy-to-use, simple application – allowing companies to link all aspects of the plant floor, from operations to analytics, in a single, solution-centric environment. Features of Proficy Console include an installable “solution” concept with pre-filtering User Interface choices and the ability to guide a user through the system, a multi-host container to permit the same organizational and navigational paradigms across content from multiple internal and external data sources, and a user-centric information architecture that reflects Six Sigma research into how users think about their plants and require information for greater ease of use. Furthermore, using a long-term, strategic development vision, GE Fanuc designed Proficy Console to align with Microsoft Corp.’s upcoming “Avalon” display technology, planned to be delivered as part the Windows “Longhorn” Client Operating System. Avalon will enable GE Fanuc and its customers to build applications that provide rich, highly interactive user experiences. In the third quarter of 2005, GE Fanuc will release Proficy Enterprise Connector, which offers a packaged two-way information highway between the Proficy Platform and enterprise systems such as SAP – which enables users to achieve the real-time enterprise by making business sense out of plant data in real time. 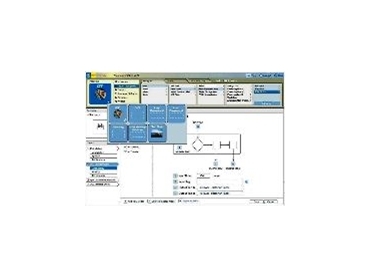 For use in Plant-to-Business solutions, workflows and Enterprise Application Integration (EAI), this new enterprise connector provides off-the-shelf support for Business-to-Manufacturing Markup Language (B2MML) schemas and standard SAP orchestrations, and is based on Microsoft Corp.’s BizTalk® Server. As an industry leader in HMI / SCADA applications with more than 185,000 installations around the world, GE Fanuc will release major upgrades to Proficy HMI / SCADA capabilities, as a key component of a world-class production management solution. In 2005, GE Fanuc is enhancing the engineering productivity of Proficy HMI / SCADA – CIMPLICITY and Proficy HMI / SCADA – iFIX with Proficy Platform integration, new graphical tools and utilities, change management integration, and control system discovery and synchronisation. In 2006, GE Fanuc will release enhanced HMI / SCADA solutions with a new SCADA engine. SCADA developments will include new graphical editors, redundancy, and an expanded block library. The HMI / SCADA releases will also feature new device connectivity toolkits and rich data types with OPC UA support. For 2007, GE Fanuc will offer visualisation consolidation – with one integrated HMI / SCADA platform for operation, supervisory control and analytics, based on Longhorn and Avalon technologies.